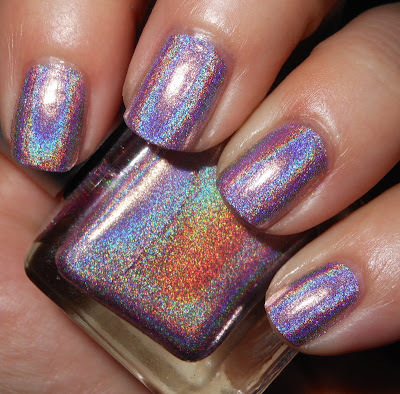 Today, I have another one of the Urban Outfitters holos to show you. Speaking of Urban Outfitters, I haven't been in a few weeks. I was going maybe every 2-3 weeks before, and every time I went they had something new and totally awesome. I should make a trip sometime soon to see if they have anything new! On to holo magic! Pink Holo is a strong linear light pink holo. This one is a bit tricky color wise. I find that in some lights it looks pink, and others it looks kind of lilac. Honestly, I couldn't careless what shade of pink or not pink this because this is flipping amazing. The holo effect in this is so strong that it's magical. This just makes me so happy! I got this at Urban Outfitters for $10.00. WOW, what an awesome photo of this. Great job. I can't get over how much wow factor these have - so strong! Aww, this is so pretty! This is so pretty! Gorgeous picture! I am hoping I can still find this-- one UO I went to last week after Christmas only had the silver and green holos and I'm lemming this like crazy right now.